With 'big data' being one of the business intelligence buzzwords of last few years, no wonder that publications on business analytics and dashboard design pile up in bookstores. You must be familiar with those trends and keep up with the developing technology, but who has time to read all those books? We picked up eight titles that have gathered praise quotes both from industry names and data analytics beginners. Our top eight positions of business intelligence books discuss a comprehensive range of subjects which reach beyond the rudiments, but thanks to clear explanations, examples and cohesive descriptions they are still reader-friendly. Let yourself be inspired by some great data insights. If you do spend a lot of time on spreadsheets wondering how to choose the right data visualization type this book is just for you. It's a short and easy read that will teach you all the basics on how to make professional graphics. It's great if you're an online marketer or just someone who has to handle data for reports. This book shows that what matters when creating charts isn't about making them flashy. Instead, it's about making them clear, effective and meaningful. The author Dona Wong shows us that there are the best colors and fonts to choose for certain types of data. She shares plenty of subtle yet useful examples of how to display data. One example is how you should display the biggest part of your pie chart at the 12 o'clock mark. Certain readers might find a lot of information too basic. Wong shares some rudimentary knowledge and rules you should follow every time you prepare a chart. The more sources of data you have access to the better. One business that relies on one gauge is no match to one with an array of intelligent tools. With an array of interactive online dashboards on your side, you will be able to gather and visualize up-to-date metrics. Consequently, you will be able to base your business decisions on real-time data rather than your gut feeling. This is the perfect book to help you shape a data-driven business culture. In his book, Wayne Eckerson summarizes everything related to business dashboards. He overviews how to install and maintain the effectiveness of a real business dashboard. This book is useful for technical or business managers who oversee their team's performance. It's for data-driven people. Eckerson will help you refine your communication strategy. He understands the technical and social impact of launching BI software across a company. It does a great job at pointing out good business habits to maintain an effective dashboard culture in your company. It'll help your dashboards with the operational, tactical and strategic vision of your business. This comprehensive, clearly-written book introduces the fundamental principles of data science and walks you through the analytical process necessary for extracting useful knowledge and business value from the data you collect. It's laden with examples so dust off your high-school math skills and follows the data-analytical thinking. The position includes success stories of the model use of data science by leading companies and illustrates how data science solutions helped them deal with big business challenges. With a wide spectrum of subjects ranging from predictive modeling, identifying informative attributes, segmenting data by progressive attribute selection to estimating costs and benefits and calculating expected profit - this book will take you on a real data science journey. Don't be deceived by advanced data mining topics - this book will teach you practical skills. You'll not only learn how to improve communication between business stakeholders and data scientists but also how to participate intelligently in your company's data science projects. You will understand how data science fits in your organization and how you can use it for competitive advantage. It will show you how to approach business problems data-analytically, using the data-mining process to gather good data in the most appropriate way. The book will open your eyes to multiple data science applications, for example in the recruitment process. This book constitutes a sufficient introduction to the topic of big data. However, don't expect it to teach you the analytic methods, but rather to explain to you in a plain way how Big Data works. People who have already been interested in this field before won't be disappointed either. Readers will learn why Big Data is a big deal and why it is necessary for organizations to learn how to apply Big Data in their daily operations. Simon interlards jargon-free expert advice with real-life case studies, analyses, and quotes by Big Data practitioners, turning it into a complete package of an interesting read. A great asset of this book is the way Simon puts the Big Data trend into context, for example of history, related technologies, culture, and consumer behavior. The author stresses that according to all indications, Big Data is not a fad but rather a new reality or a trend that is only going to intensify in the coming years and make a mark on the business world of the future. It's high time for more businesses to start appreciating the added value that comes with Big Data analytics. The uniqueness of this book lies in the survey designed by its author, a Research Vice President at Gartner and an experienced BI analyst, who revealed analytical strategies used by the best players on the market. It's not a theoretical piece but rather a story about strategies that work and a source of inspiration. 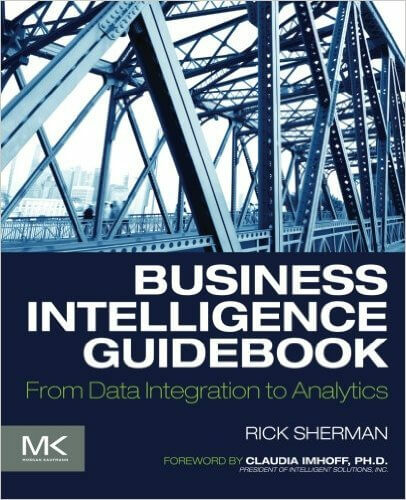 The book features multiple successful approaches to business intelligence, as each organization requires a different BI implementation and there is no one single, ready-make strategy. However, the successful implementations profiled in the book share some fundamental principles that each agile BI solution should follow. There are certain tools mentioned in the cases studies by name to serve as an example of best principles rather than give a prescription. The rest remains in the hands of a BI practitioner, but don't worry, Cindi Howson will help you out with some proven methods. She provides advice on how to create an analytic culture in your organization so that every team member will find data relevant and actionable. She also describes how to align the BI strategy with your company's business goals, improve the quality of data and monitor its maturity across various factors. In comparison to other books on our list, this one doesn't explain Big Data to its readers or tell how to solve design problems. On the contrary, the authors provide us with a useful action plan. The structure of this book encourages readers to start using it right away and design their own BI strategy. Each chapter covers a different stage of a BI project, including practical details like project flow charts, project roles, and risks involved in each of the steps. You may deem the contents not innovative enough or point out some technical shortages but don't forget it's not an academic book but a typical, well-written project manual. This business intelligence book explains data warehousing and business intelligence concepts in great detail. It starts with an overview of why data is so important in the business world today and proceeds to cover all facets of a BI project. From purely technical aspects of a project, product architectures, data modeling and through tons of illustrations, this book really helps to understand the intricate subjects. Other topics covered include data integration and BI design, wrapped up by people-related issues, such as processes and project management. Sherman has succeeded in finding the right balance between a position for experienced practitioners and a manual for data analytics beginners. He takes a comprehensive look on business intelligence, covering the business and technical aspects of BI, the architectural underpinnings both from a high-level solutions architecture as well as low-level query design patterns perspective. Whatever are your responsibilities as a business intelligence practitioner, there are chapters in this book relevant to your particular area of competence that provide new skills or spark new ideas. Just like other bestsellers about business intelligence, this one starts with a short section about the theory of data warehousing and analytics, only to move on to a selection of case studies showing how to apply the theory to common business scenarios. There are 14 case studies included in the book that stems from numerous industries, for example, electronic commerce, procurement, order management, financial services or human resources. In the table of contents, it looks as if those chapters applied only to the specific industries mentioned. On the contrary, these industries are used as examples to help readers better understand the underlying design principles. The book covers both technical and business aspects and is up to date with state-of-the-art practices and topics. The content covers dimensional modeling techniques and mistakes, bridge tables for ragged variable depth hierarchies and multivalued attributes, project management guidelines as well as comprehensive review of extract, transformation, and load (ETL) systems and design considerations. These eight business intelligence books will make a solid foundation for your business dashboard education and convince you of the benefits of data science. Put this knowledge into practice and start creating your own business dashboards today.